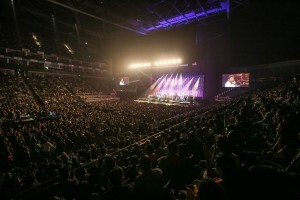 For India’s Independence Day AR Rahman, held a concert at the O2 Arena to a sold out crowd, accompanied by an orchestra of musicians, singers, table players and qawwalli’s. The concert was dubbed as « The Greatest Hits of AR Rahman » and whilst driving to the venue, it made me ponder: how can one compound Rahman’s oeuvre into a single sitting? When Rahman debuted on the Bollywood scene in the 90’s, Hindi audiences had heard murmurings of some of his offerings down South with Roja and Kadalan (Hum Se Hai Muqabla) dominating video charts. The music scene was much more fractured and isolated in the 90’s and there wasn’t ever a need to importing talent from another region. If movie producer or music director liked a tune, they just copy pasted wholesale and had the son resung by another local singer and no question was asked. This even happened to some of AR Rahman’s early songs, there were at least 4 Hindi versions of Muqabla floating on the airwaves at the same time. 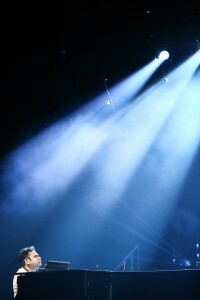 But Rahman’s talent was such that his unique voice could not be denied. His music has always felt very personal, making the audience feel a sense of misplaced ownership. 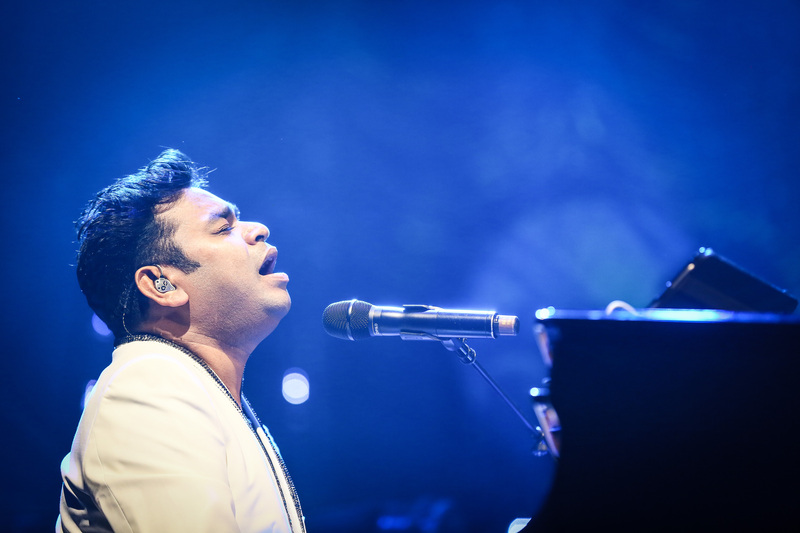 But sitting in a jam packed arena, I understood, I wasn’t the only one that felt this ownership over « my» AR Rahman. AR, like any musician, understands that his music is not his anymore once it is released to the airwaves but belongs to a collective that needs to be fed. He tried to deliver on the expectations his audience has with him, he managed to partly on the promise despite some production mistakes. Javed Ali started things off with a very soulful rendition of Delhi 6’s Arziyan, which seemed to be a prayer to kick off the concert as well as salutation to the audience. 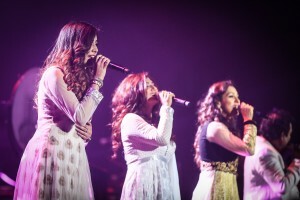 Arziyan was followed up with a selection of classic hits like Chinna Chinna Aasai /Choti si Aasha (Roja), which was in 2 different languages sung by the wonderful and ever present Jonita Ghandi, the seemingly demure Shashaa Kiran Tirupati and the vastly under-used vocal powerhouse that is Neeti Mohan. Tu Hi Re was the sole pick from the Bombay soundtrack (I was hoping for so many more like Satrangi Re of Jiya Jale but alas) by Haricharan who managed to command the song in 2 different languages versions – whilst doing a pretty good Hariharan impression. Then came Dil Se’s title track sung by AR himself as he duelled Natalie Klouda, his wonderful violinist on the piano, which was an amazing spectacle. The next half hour block was mostly from AR Rahman’s South Indian and private albums, which unfortunately for most of the Hindi audience in attendance felt like watching other people have lots of fun whilst they had a glazed expression over their eyes. Some audience members even started grumbling quite vocally and this might have been the only dip in the otherwise amazing set. Some of the production choices were very odd, the first half ended abruptly and there was confusion if there was going to be an interval or not, the audience was left to their own devices, which is never a great choice with a South Asian audience. This happened again at the end of the show, there was a definite lack of cues and the band just disappeared without an encore. The confusing interval ended up lasting only a couple of minutes, the curtain suddenly went up and AR and Jaaved Ali had donned their qawalli hats and tablas for the double whammy of the hypnotizing Kun Faya Kun (Rockstar) and soulful Khwaja Mere Khwaja (Jodha Akbar). Unfortunately some the magic of the Sufi segment was broken by the part of the audience hurriedly running back to their seats with still very wet hands from their bathroom visits. Always being a trailblazer, AR wanted to showcase a movement based instrument but technology failed the crew twice, forcing AR to climb back behind his piano and nervously entertain the audience with impromptu tunes. When they managed to get the tech to work, you realized it was supposed to be background vocalist IsshrathQuadhre time into the limelight but unfortunately for her and the audience the moment had passed. From then on there was a clear course correction and the hits and performances were non stop, Neeti Mohan brought energy with her RE RE segment (Rangeela Re and Jiya Re) but overall she felt a bit underused compared to Jonita who pretty much dominated the pre-interval as well as jiggy-ing in group songs and some Hindi too. Jonita is a wonderful stage presence and very versatile, definitely one to look out for. Same for Karthik who was an absolute crowd favourite amongst the South Indian and clearly a born showman but only made a fleeting appearance and didn’t sing any Hindi songs. During the different sets, AR Rahman would change get ups, some with hilarious combinations like a sparkly hat paired with a biker jacket or in the case of the bluesy Jaane Tu Ya Jaane na, he wore sunglasses like he was Ray Charles from Chennai, luckily the music always delivered and the powerful voice and jazz scatting of background vocalist Annette Philip’s really stepped up to the plate. The show provided every member of AR Rahman’s band to shine too. The ones that really stuck out were Naveen Kumar’s flute during the Roja interlude, Mohini Dey’s bass (a 19 year old prodigy part of AR Rahman’s band NAFS who is also rumoured to be collaborating with Quincy Jones), Ranjit Barot’s drum and Keba Jeremiah Arul’s guitar solo’s during a very rocky rendition of Nadaan Parindey. Ultimately the show couldn’t possibly have delivered on every song that a demanding fan might want of AR Rahman’s as we are a spoiled bunch now and even if combining sets from all languages didn’t always works as well as one would hope. What the show does give you is an evening with an artist of the likes only comes around once in a century, and as an audience member, that seems like the highest privilege.